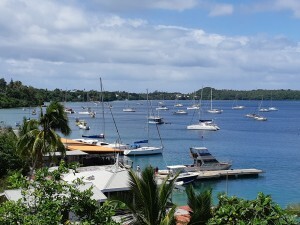 The anchorage at Neiafu, the main town of Vava’u, is well protected from all winds and crowded with moorings. There seemed no alternative but to pick one up or anchor way out in water about 30m deep. 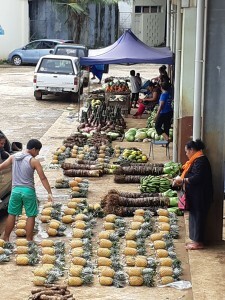 I used the time there to do some shopping at the really good open market where it was evident that pineapples were in season. Very sweet and deliciously juicy. 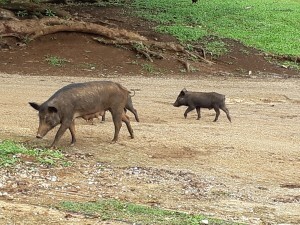 Walking around the outskirts of town I was amazed at the number of pigs and piglets wandering freely about. I found out later that many of them are feral and are a bit of a nuisance. Although, I thought the tiny piglets were rather cute, always keeping within safe proximity to their own personal milkbar and protector. On one of my walks, to have a look at a small cave, I was viciously attacked by a pack of 5 or 6 dogs. It was a terrifying experience. Luckily I was rescued before too much damage was done. The local hospital gave me a tetanus shot but no stitches were required. I’ve been advised to carry a stone on my walks so that I can threaten to throw it at any worrisome dogs, as they are generally known to be a bit of a problem. After paying for a week on a mooring I decided to try to find a less crowded place to anchor. 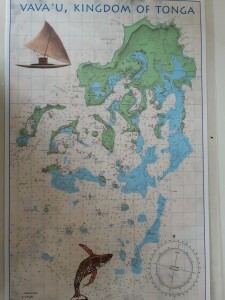 I had managed to get a copy of a chartlet showing the recommended anchoring spots and set off to start exploring. 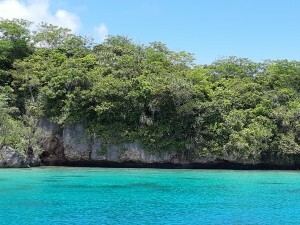 After a short (5 miles) sail I found a place in the beautiful bay of Port Morelle. Not really a port as such, just a lovely small white beach at the head of a bay surrounded by forest. It was wonderful to be away from the throng with only 2 or 3 other boats in the anchorage. 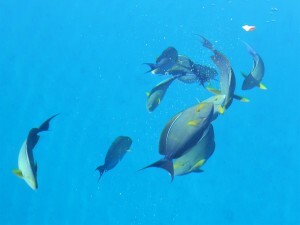 A strong east wind had been blowing ever since I first arrived but here it was relatively calm with crystal clear water making snorkelling irresistible. After a few days the wind finally dropped and I paddled across to the reefs that line the shore. Inevitably, after about a week, the wind came round to north west which is the only direction to which the bay is open. It kicked up a nasty swell – time to move on. So another five miles of magical sailing to the island of Nua Lapu where I picked up a free mooring in the lee of a small village. Dogs eyed me from the shore and I was quite happy to stay on board..
Next day the sun was out at last and I snorkeled among brightly iridescent turquoise and indigo fish. But supplies were running low and I sailed back to Neiafu for a quick shopping trip. 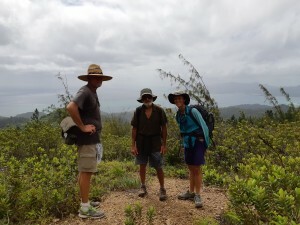 While having a coffee break, I met Sheri and Larry who told me about a good long-term anchorage near Tapana Island. They have a small catamaran and have been living there for the past 20 years, weathering many cyclones. It sounded like a plan. I sailed there the next day really enjoying the clear, flat water, gentle breeze and exquisite surroundings. What a change to be sailing for the sheer pleasure of it. 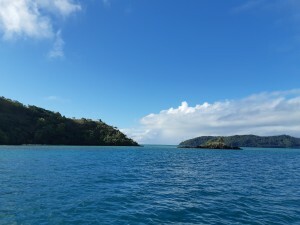 The Tapana Island anchorage is everyone’s dream of the South Pacific. A really lovely place to relax and unwind. Calm enough to be able to do many of the jobs needed on Speedwell. I have the use of a very secure mooring and plan to stay here for as much as possible of the cyclone season rather than spending months in the Boatyard. Hopefully hauling out only just before I leave to do the usual antifouling. A flock of Black Noddies have adopted Speedwell as the perfect place to perch and watch the water for their next fishy snack to swim past. They squawk and dive and flutter back. Sometimes the water is alive with bigger fish. A pair of tropic birds have a nest ashore and a small blue heron patrols the beach in the evenings. What a wonderful place. If only it wasn’t for those cyclones…. 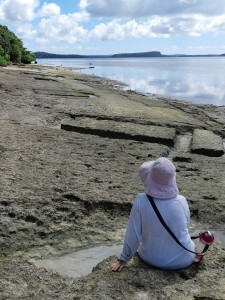 I spent eight days in Raiatea moored off a friendly boatyard. I was relieved to find that it was possible to restitch the sail in situ as it would have taken far longer if I’d had to remove the sail completely. A few other small repairs to the rigging were needed and the usual attempts at repairing the Navik. 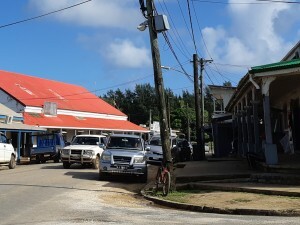 The main town of Uturoa was a long walk away along a busy road. No public transport but I was usually able to get a lift, at least for the heavily-laden return trip. I was surprised to meet up with Robert and Connie on their yacht, ‘Andiamo’. I had last seen them in 2003 in Mar del Plata when I was with Pete Hill on China Moon. They had access to a car and helped me to transport two jerry cans of diesel which I will use if necessary on the next leg of the trip. After a week of hard work and expensive shopping for provisions I had a good break on Sunday when I joined Jay, Erwin, Douglas and John from other boats in the anchorage to go on a hike to the top of the island. It was quite a stiff walk at times and I felt the effects of all those months at sea with little exercise for my legs. The next day, Monday 24th September, the weather looked good and after making my farewells I headed out through a comfortable pass through the reef. It was slow and roly at first in the lee of the island but soon enough we were speeding along at 5 knots. For three days we made wonderful progress making good nearly 100 nm each day. The sail looked fine and with a steady wind and reasonable seas the Navik was managing very well. As the wind got a little lighter on the 4th day out I cautiously raised the bottom panel with the repaired batten. It showed no signs of stress and I was able to use it whenever necessary for the rest of the trip. 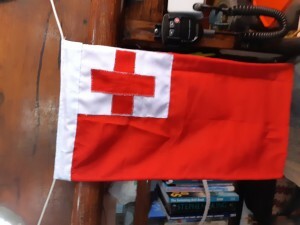 I started working on a hand-stitched courtesy flag for Tonga. Of course it couldn’t last. 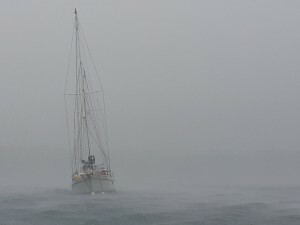 On the 28th the wind switched to South and strengthened with a series of heavy rain squalls and black clouds. I quickly reefed right down and we were able to keep going with the wind on the beam. The Navik had to be refastened a few times. I was happy that I had been able to replace the broken zip on my rain jacket. I tried to pick up a weather fax but the daytime reception is very poor and there was nothing intelligible. Later at 3 in the morning I was able to get a very smudgy weather fax but there was enough to show that the outlook was not too grim. The pressure stays constant. I was able to get a few hours sleep. We were passing fairly close to Aitutaki, one of the Cook Islands, and I had thought I might stop there for a break and get get some weather information, but we were moving well, now with 4 panels up, and I preferred to keep going. Next day we were down to 2 panels and a very rough sea. I didn’t feel like making all the effort required for cooking a proper meal and made do with a big bowl of popcorn. A few days later we were approaching Palmerston Island. 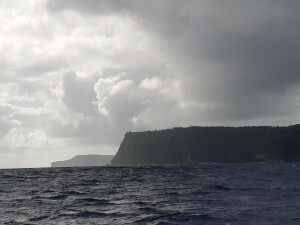 Another possible place to stop and regroup, but the weather was so nasty that I doubted if the anchorage, which is outside the reef, would be tenable. That night I hove-to again and brought the Navik below to replace the washer which had effected such a good repair previously but had now fallen off. The epoxy takes 6 hours to cure so with some luck we should be on our way again in the morning. Moving on with just the top panel. Still many problems with the Navik which needs regular intervention to stay on course. During the night we gybed twice and I eventually realised that the string I was using to tie the vane and hold it at the correct angle to the wind was too thick and at a particular angle as the vane swung on its axis it was jamming against the string. I found some thinner string and it was easily fixed. But when I had a good look at the paddle I was aghast to see that it had developed a serious bend. In it came again and I wondered how I was going to straighten it. While at Panamarina I had watched the beefy welder clamp the steel shaft in a vice and nonchalantly and seemingly effortlessly, bend it straight for me. I had no big vice on board so I clamped it as well as I could between my feet and bounced my full body weight on the bent section. It worked! Soon it was remounted and back in action, for the moment. Only 560 nm to go. I woke up this morning to good sailing conditions again. Hauled up another panel of the sail and we are running dead downwind at about 4 knots, nicely on track. I was able to brew up a pot of real coffee after 3 days of instant. Spent the afternoon putting the finishing touches to the Tongan flag. Over the next couple of days the wind died completely and we wallowed about on a satin smooth sea. 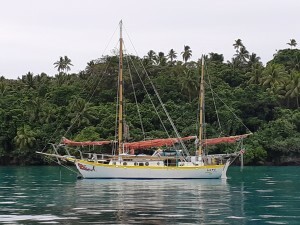 I was grateful for the diesel I had bought in Raiatea and wantonly fired up the engine and attached the electric autopilot to the tiller. What bliss to sit back and let technology do its thing. Of course I couldn’t allow myself to get completely carried away as I only had a total of 30 litres of diesel on board and needed to keep some in reserve for the final approach to Neiafu. We had a favourable current helping us along and by keeping the revs just at the point where the engine ran smoothly with no vibrations we managed 4 knots. After 24 hours there was just enough of a gentle breeze to hold the sail out and I have to admit it was more peaceful without the racket of the engine. Wind blowing strongly again but we are moving comfortably along. The sky is a messy confusion of scratchy cirrus clouds which is not a good sign. I hope we get in before the bad weather arrives. Arrived 10 miles NE of Vava’u at 3am. Still pitch dark with strong wind and rough sea. An accidental gybe convinced me that it was time to heave-to for a couple of hours, get some sleep and wait for sunrise. A ship in the distance showed up on the AIS. The first traffic I had spotted since leaving Raiatea. We started sailing again at first light along the west coast of the island. It was quite spectacular with steep cliffs and wooded slopes. The sea much flatter in the lee of the island. The entrance to the sheltered waters was outstandingly beautiful with small scattered islands leading up to the narrow channel through to the main harbour. Once through the narrow section, I lowered the sail and put out some fenders and ropes as one has to tie up to the customs dock on arrival. When I got closer I saw to my dismay that the dock was very high and very rough and I doubted if I could even reach the top to tie off a rope. Luckily there was a medium sized wooden fishing boat at the dock and they agreed to let me raft up alongside them and helped me with the lines and fenders. I was very grateful. The yellow quarantine flag was hoisted and soon enough the full contingent of customs, agriculture, health and immigration officials arrived with reams of forms to be completed. All managed to clamber across the fishing boat and negotiate the rather awkward access to Speedwell. It was certainly easier for me than having to track down all the various departments ashore as I have had to do many times before. After clearing in was completed I moved away from the dock and was obliged to pick up a mooring as there is no anchoring allowed in the sheltered bay. I plan to spend a few days on the mooring and then hope to explore the rest of the island group. 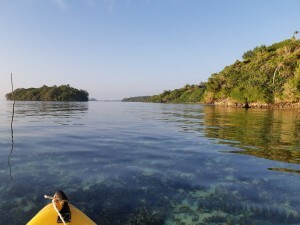 The Gambier Archipelago is the sort of place where I could happily spend a few months but it was not to be and after picking up a last Passage Weather forecast and dumping my garbage I rowed over to Otter II to say goodbye. I may meet up with them again in New Zealand. The usual hard work getting the anchor up from 27m below and we motored carefully through the well-marked reef. The wind was quite fresh SW. I wondered if I should be waiting another day. It took 3 hours to cross to the island of Taravai where I planned to spend the night. I tried the Navik and it seems to be OK. 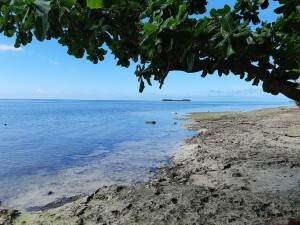 The anchorage at Taravai is surrounded by reef and a rather shallow patch has to be crossed to get in. The tide was going out and the light was bad with the sun in my eyes. Second thoughts about going in but I didn’t feel ready to go to sea and wanted a good night’s sleep so I pressed on. The Navionics chart bore little resemblance to reality. At one point I bounced off the bottom where the chart showed 9m. I carefully explored the area and eventually put the anchor down in 15m close in to beach and shallows but with plenty of swinging room. Overnight the wind picked up a bit but we were comfortable enough. It poured with rain. The primus burner developed a startling leak. I hope I can find a replacement in the morning. Just managed to finish cooking my dinner with help from the emergency gas stove. I had to wait until midday for conditions to ease enough for me to venture through the rather unnerving reef. Then it was strong wind and big seas for the first 2 days which had us racing along under the top panel only with the Navik holding us faithfully on course. The wind was from the SE and I used it to get a bit further N where the forecast shows better weather. Now the wind has dropped a bit and backed to NE. 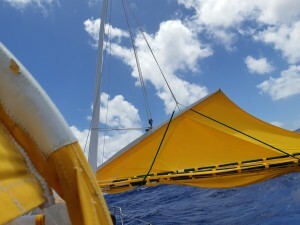 We are moving comfortably and have been doing nearly 90 nm per day. A slow slog to windward followed until we came up to a solid bank of cloud and the wind did a sudden 100° shift to the SW. Very gusty and unsettled. Calms and squalls. Very heavy rain. I came up on a port tack and it looked promising for a while but by sundown the wind had strengthened so much that I decided it would be best to heave to for the night. This turned out to be a good decision and I had a reasonably comfortable night’s sleep while we drifted slowly on course. Just two panels up. A dark night with no moon. In the morning the wind was still about F7 but now I could at least see what was going on. By 11 the wind had dropped a little and I eased the sail out and set up the Navik to hold the wind on the aft quarter, moving along reasonably easily doing just under 4 knots, but not for long and soon we had to heave-to once again. Slight improvement in the weather this morning the pressure is still very high. Waves still too big for me to try sailing again. After lunch I checked the Navik thinking that we might be able to get going again soonish. 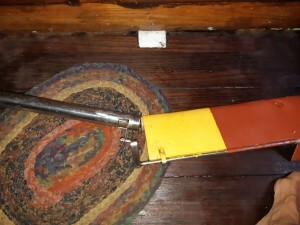 The lashing I had tied to hold the paddle on its worn down pivoting pin had broken the steel loop and the paddle was flapping helplessly about. Always something. I managed to get it out of the water and down below. My son, Pete’s wonderfully sharp knife was used to cut the lashing. The problem is that the cone shaped notch that the pivoting pin fits into has worn away and is now too big so the pin keeps slipping out. The lashing had been holding it together but now I no longer had that option. What to do? I decided to try using some steel epoxy gunge to glue two washers over the enlarged hole to make it a better fit for the pin. Now I’ll have to wait 6 hours for it to cure before I can test it. Maybe in the morning the weather will be OK.
I’ve decided to head for Raiatea which is half the distance to Rarotonga. Still in French Polynesia so I’ll have to keep a low profile. Weather still too bad to start sailing again. 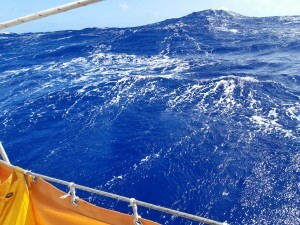 We are slowly moving N which takes us closer to Raiatea and hopefully towards better weather. 4 days hove-to is becoming boring. At times I despair of the weather ever changing and imagine the boat slowly giving up the battle and falling gradually apart. Being overwhelmed by the huge seas and raging wind. On the long passage from Panama there had also been bad times but I had a bottle of champagne in the booze locker and planned to go down sipping the bubbly. Now all I had was rum. Quite a lot of water getting into the bilge because of the breaking seas swamping us every now and then. I rigged up the hose so that I can have it ready for pumping without having to remove the engine cover each time. All these small problems start to snowball. Tried again this morning to start sailing but still too rough. I need to reinstall the Navik paddle and can’t do it in this sort of sea. So we stay hove-to. Pouring with rain. Every now and then a big wave sweeps us and water pours below. The sliding companionway hatch does little to prevent it. My bunk is sodden. I doze off and cold water splashes me rudely awake. The little bilge pump keeps things under control but will flatten the battery if we don’t get some sun soon. The primus has been soaked and now is impossible to light. I’ve used up nearly all the alcohol I have for preheating in futile attempts to get it alight. I really need my caffeine fix in the morning so made instant iced coffee with nescafe. Don’t normally have it on board but bought it for the line handlers when we transited the canal. Not too bad actually. Yesterday I discovered that couscous will soak up cold water quite well so I’ll have couscous and canned vegetable salads for a few days. The bananas and almonds that I was given in Mangareva are good for snacking. A trail of banana skins in our wake. About 10 in the morning the weather was starting to look reasonable again. Heavy rain seems to flatten the seas a bit but inbetween the rain showers the wind gusted strongly. It was still impossible to perch on the stern and try to install the Navik. I wasn’t happy with my chances if I was washed overboard hooked on with my safety line. Too many things around the stern for it to get caught on and I’d be trapped unable to loosen it and unable to climb back on board. So wait until things calm down a bit more and trust in my ability to hang on. As soon as the waves lost their overwhelmingly mountainous aspect I loosened the tiller and set up my faithful bungee and rope arrangement to do the steering. It worked pretty well and we were on our way again at last! Wind still strong enough to only need two panels. I’m getting used to cold coffee but wish I could cook a hot meal. Dried beans, pasta, rice need cooking. When I get desperate enough I’ll mine the storage in the forepeak which is now full of stuff, to find a spare burner. I never throw one away so I have a big collection of old carboned-up ones. Some old stoves too. But it’s a fiddly job and can wait till conditions are easier. Thank goodness for bananas and nuts. 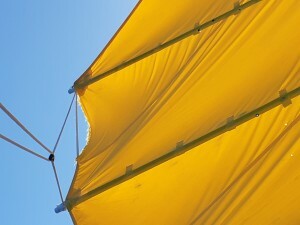 The wind died completely last night and I hove-to once again this time to stop the sail flopping about. What wind there was moved us ever so slowly in the right direction. Probably a bit of favourable current. As soon as it was light and I had primed myself with a cold caffeine fix, I was able to re-install the Navik paddle. My repair seems to be working and now we are really sailing again. The wind has backed to N and we are moving happily with it just forward of the beam. This morning the wind had dropped and I raised all except the bottom panel. I don’t really trust my repair job and don’t want to hassle with a broken batten again. Wind still forcing us north but I’m hoping it will back more easterly soon. I took the opportunity to start drying things out and put on fresh clothes. After a bit of a battle I managed to light the primus. Looking forward to a hot meal tonight. When I checked the Navik I saw that the smaller washer I’d epoxied on had come adrift but the big one is holding and seems to be able to keep the paddle in place. Went forward to secure the fortress anchor which was coming loose. How much easier everything is in gentle weather. 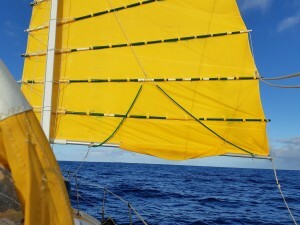 I’m still hoping to be able to spend some time at Raiatea fixing the sail, etc and stocking up with more food. Not sure if I’m going to make NZ this year. Flat calm all day. A chance to start drying things out. Got the primus working again. Made a raisin bread. Had a lovely fresh water wash in the cockpit. Reading Emma. First thing in the morning I was able to start sailing again. Dead downwind doing 2 knots. The sea was flat and things were looking up. Sitting dozing in the cockpit I was suddenly startled by the incredibly loud noise of a plane making a low fly-past just above the mast. I waved thinking it might be sightseers taking a look at us but then it circled and came over again and I read ‘Marine Aircraft’ on its side. Went down to switch the radio on and they called ‘Yellow Sailing Ship….etc’ Their transmission was very clear and their English good. I was able to manage without my hearing aids. They wanted my name and the boat name and asked if I had seen a sailing boat that they were searching for. I didn’t catch the name of the boat, but of course I had seen nothing. They thanked me and flew off. Bit of excitement. I wonder if the boat they were looking for had also been caught in the gale. After a frustrating morning of alternating calms and heavy rain showers the wind strengthened a little and we made some progress at last. So wonderful when the weather gives us a break. There was even a bit of sunshine. Too good to last of course and by sundown the wind had dropped again and was only just able to hold the sail out. I cooked up a tasty brown rice concoction in the pressure cooker and had a proper meal for a change. The top section of the Navik has started to wobble about and I have had to tie it down with a piece of string to stabilize it. The poor thing really seems ready for retirement. 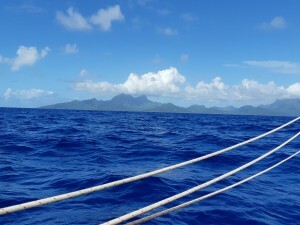 Three days of perfect sailing weather took us past Tahiti and Moorea. Only about 5 miles off the craggy coast of Tahiti, it looked quite dramatic. 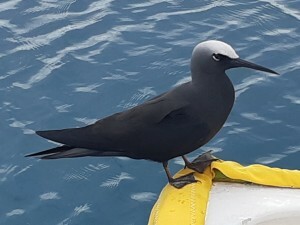 Friendly Tahiti Petrels greeted us and I even spotted some dolphins. A small fishing boat passed close by and waved. We had a fast run all night and arrived at the pass through the reef at Raiatea at 10:30 in the morning. Fast downwind through and then the magical calm of protected water. Quite beautiful. The anchorage off the marina was very deep and all the boats there on moorings. Picked up a free one reasonably close to the marina but found that it was a private one. Richard, from a nearby boat advised me to stay as the owners might not be back for a while. Started cleaning things up and drying out. 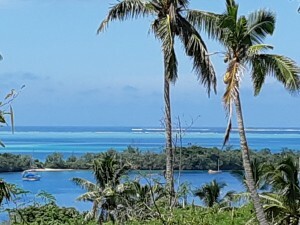 Wonderful view across to Bora Bora only a few miles away. 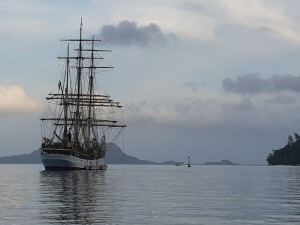 When I arrived in the anchorage at Rikitea, the beautiful sailing ship ‘Picton Castle” was there. What a romantic sight. As soon as I had settled in they sent over a launch with a big bag of very welcome fruit. They planned to leave the next day but when I told them about my problem with the self-steering gear they had me bring it over and did a great job of fixing the broken bit. So wonderful! The little town stretches along a single coastal road and I had no problem finding the Gendarmerie to clear in. Unfortunately I did not have the necessary visa for French Polynesia and was only granted 15 days. Rather a pity but it would be enough time to sort out the batten, put the Navik together again and restock with food and water. Not the cheapest place to reprovision but the little shop had a good selection of imported French delicacies and I went a bit wild with good cheeses and other treats. Local Rum was a shocking $30 a bottle. 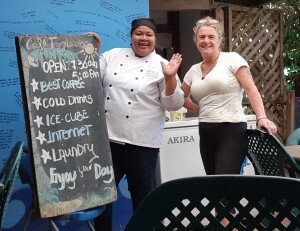 The short stay was probably a blessing as after my slow passage from Panama I needed to keep moving if I wanted to reach New Zealand before the start of the cyclone season. My worst job was cleaning the hull. The bright yellow top sides had become almost completely covered in black and green algae which was very difficult to scrub off. Then I had to tackle the goose barnacle forest on the underwater part of the hull. I had been colonised by a group of voracious remora fish but they seemed to have no appetite for barnacles. Eventually the boat was starting to look presentable again and I spent a few days repairing the batten between rain showers. Luckily I still had a good supply of fibreglass cloth and epoxy and was able to line the batten up reasonably straight and fashion a sleeve of many layers of glass which seems to be holding it together. When there was a calm day I raised the poor tired sail and used contact glue to stick patches over the chafed area and moved the bottom batten, which looked like a good one, into the slot vacated by the broken one. The repaired batten went down to the bottom panel which will only really be needed in light winds. Not much chance for sightseeing but the anchorage itself is quite beautiful and I was happy to just be there. People were very friendly and I was showered with gifts of local fruit – pomelos, oranges, bananas, papayas, breadfruit and coconuts. Absolute bliss after weeks of tinned stuff. There is an enormous church in the village – the result of madly over-zealous missionary activity in the old days. The elaborate altar is entirely decorated with shells. Rather different to the overpowering gold decoration in many South American churches. As my allotted 15 days is for the whole of French Polynesia I am planning to make my next stop at Rarotonga in The Cook Islands, about 1350nm further along.